Another day, another Android phone. 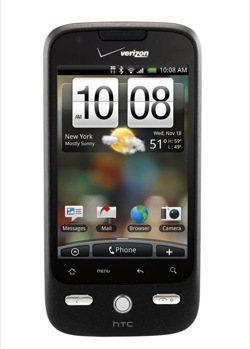 I believe we will soon come to a day when Android phones will be looked at with the same jaundiced eye as, say, the latest LG Chocolate, but since that day hasn’t come, I’ll share a few observations with Verizon’s new $99 Hero-alike, the Eris. The Eris is basically a mini Hero. It’s slightly thinner and clad in all black and but the Sense UI is in place and all of the things that made the Hero great – responsive OS, apps, and social networking connectivity – are here. One thing lacking, however, is the “latest” version of Android with its superior navigation application and multi-touch. I asked some HTC folks about what was going on and they informed me that HTC is sticking with Sense UI and that some of the tweaks they did to pre-2.0 Android didn’t mesh well with the latest version. The result is, as I’ve mentioned before, a new “branch” of the OS. To be sure HTC can’t sit on the sidelines with this for long, but it’s abundantly clear that the issue of non-centralized OS development is rearing its head here. This is Anrdoids blessing and its curse and I think the real problems will occur when handset manufacturers try to hide Android behind their own proprietary masks, much in the way TiVo and Kindle use Linux on the inside but make not mention of it. It’s a question of when, not if, HTC will go 2.0. But for now they’re sitting things out and perfecting their UI going forward. Update: We just heard back from HTC, and it appears that the Eris does in fact have multitouch in certain areas. They (being HTC) added multitouch capabilities through their own coding using android 1.x, so as a result the code isn’t available to 3rd party developers. But for the record, the Eris does have multitouch in the photo album and a few other places.